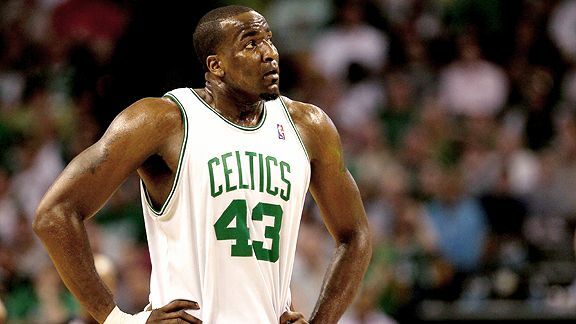 Did the Celtics have to be without Kendrick Perkins for most of Game 5? After the NBA rescinded one of his two technical fouls from Game 5, Kendrick Perkins will be in uniform but on thin ice for Friday night's Game 6 of the Eastern Conference finals. His next technical will be his seventh of the playoffs, and will trigger an automatic suspension. The Celtics lost Game 5 by 21 points. It was not close. However, it was close when Perkins was playing. During his 16 minutes of first-half play, the Celtics were outscored by just a single bucket. Perkins was ejected just before halftime, with the Celtics hanging around, down eight. I'm not saying the Celtics would have won had Perkins played. I'm saying we shouldn't have to wonder. My complaint, which I have made several times before, is that in this day and age there's simply no reason it should take a whole night and most of a day for the NBA to review a five-second play. The NBA has rescinded Perkins' second technical, which means the very call that banished him from the second half of the game last night was a mistake, for which the Celtics have already been punished mightily. It just doesn't have to be that way. Video review, insight from the players and the referees about the things that might not have been obvious on video ... these things can be done during the game, even in a timeout. Whoever weighed in on this decision at the league offices in New York today, where were they last night? If they couldn't have been in Orlando, at the very least they could have been in front of an HD screen with a feed of multiple video angles, and a phone connected to the sideline to run questions by referees. Certainly, the current system of reviewing calls the next day avoids certain sins of "the heat of the moment." But for those few calls that might be blown with instant reviews, would any of them matter as much as mistakenly ejecting a key player for half a conference finals game? Referees are expected to make the right call instantly. In reviewing that work, the league need not be instant. But in the interest of fairness, and getting things right, it ought to at least be as quick as possible. The story of these playoffs has been the Boston Celtics. At the end of the regular season, by every fancy metric I know (offensive and defensive efficiency, adjusted plus/minus lineup analysis etc. ), the Orlando Magic and Cleveland Cavaliers were not just the favorites to win the East, but were also the two leading candidates to win the championship. They were destined to meet in the Eastern Conference finals, with the winner favored to knock of the West winner. But the Celtics have systematically broken those two teams apart in eliminating the Cavaliers in six games and then going up 3-0 against the Magic (which has now, of course, become 3-2). The only possible explanation is that the Celtics are a much better team than they appeared to be in the regular season. The "Big 3" or "Big 4" -- with Rajon Rondo -- is seen as the story, but ignore that fifth starter, Kendrick Perkins, at your peril. He sets some of the meanest screens in the business, and controls the paint for one of the NBA's truly elite defenses. According to ESPN's stats and information group, the Celtics are 8.3 points better per 48 minutes than the competition when he is on the floor in this year's playoffs. The Celtics are only 1.2 points better, per 48 minutes, when he sits. Against the Magic, Perkins' role is even more profound than usual. The Magic's attack is built around Dwight Howard. To capitalize on his remarkable size and strength in the paint, the Magic have surrounded him with shooters, and they play "one in, four out." When Howard is doubled in the post, somewhere a shooter will be ready to make a 3. Except against Boston. Thanks to Perkins' extraordinary tenacity, size and defensive skill, the Celtics don't double Howard in the post much. The idea is that Howard would otherwise be able to score 40 to punish them for disrespecting him in this manner. But Perkins knows what he's doing, and Howard is instead averaging just 20 points per game in the series and has twice finished games having made just 3-of-10 shots. So, make no mistake: Whether or not Perkins plays is paramount to the Celtics. Zach Lowe of CelticsHub does a great job of wading into the murky waters of figuring out whether or not Kendrick Perkins "deserved" his punishment. On Pro Sports Talk, Matt Moore, meanwhile, makes the annoying-to-Celtics-fans but nevertheless honest point that it was certainly within Perkins' power to avoid those technicals, simply by being calm and professional, as called for in the rules. Perkins is undeniably one of the most physical players in the NBA, and the Celtics are the most aggressive team in the NBA. His playoff technicals are the predictable result of having played nearly all of his 401 minutes this close to starting a fight. If it wasn't this incident, it was going to be something else. To me, what was actually said or done on the court, and how it compares to other cases, barely matters. The truth is that the behavior of players is all over the place, while the power of the referees to punish them for this or that thing is unquestionable and absolute. It invites an absurd situation. Perkins did something for which one can rightly, by the letter of the law, get a technical or even two. He also did something that is wholly routine for an NBA game. When the speed limit is 55, and every single car goes 75, what's the one guy who gets pulled over supposed to think? Is that justice, or an almost random reminder who's in charge? The problem is not so much this or that action by this or that player or referee. It's the ever-present ability of referees to selectively enforce whatever they want, like a sheriff in a frontier town, with the bosses unable to even weigh in until a day later. Surely it would be better for the powers that be to impose a little more real-time order, and not just on the players but on how the game is called.